TePe Grey Interdental Brush 1.3mm is a small brush specially designed for cleaning between your teeth, where a regular toothbrush doesn’t reach. Using a TePe Interdental Brush brush every day, as a complement to toothbrushing, is an easy and efficient method to keep your gums and teeth fresh and healthy. 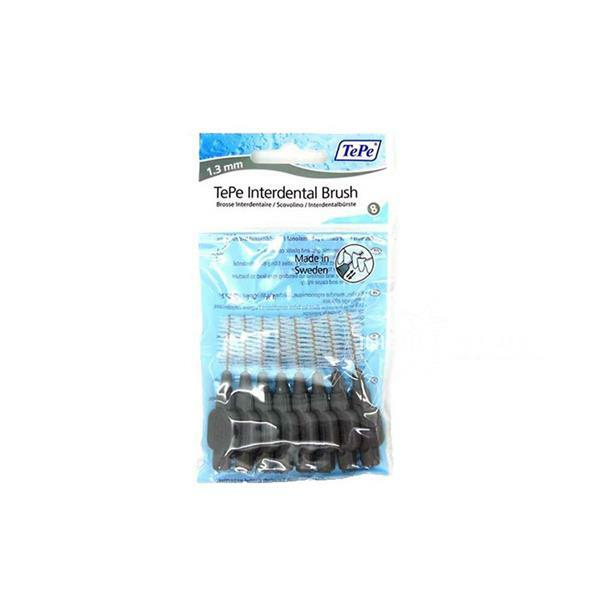 Cleaning with a TePe Interdental Brush prevents gum inflammation, cavities and bad breath. Insert the brush into the space between teeth at gum level, turning slightly. This technique aids access and prolongs the life of the brush. Once inserted, gently move the brush backwards and forwards a few times to remove plaque and debris. Brush care: Always rinse brush in clean water during and after use. Do I stop using the TePe Interdental Brushes if my gums bleed? No. If your gums bleed on brushing, then you probably have gum disease (gingivitis). Diseased gums can bleed very easily. Regular interdental cleaning will result in healthier gums. If bleeding persists, contact your dental professional. What is an interdental brush? An interdental brush is a small brush specially designed for cleaning between your teeth, where a regular toothbrush doesn’t reach. Using an interdental brush every day, as a complement to toothbrushing, is an easy and efficient method to keep your gums and teeth fresh and healthy. Cleaning with an interdental brush prevents gum inflammation, cavities and bad breath. All sizes and models of TePe’s interdental brushes have plastic coating on the wire for safe and gentle cleaning. The interdental brushes can also be used for cleaning around implants or braces. TePe Interdental Brushes Original and Extra soft have a straight neck, while TePe Angle has a pre-angled neck for extra good access between the back teeth and from the inside. The four smallest sizes of TePe Interdental Brushes Original have a flexible neck for even better access.